Designed to evoke a sense of understated elegance, this collection from Kingston Brass exquisitely enhances both traditional and transitional styles of decor. 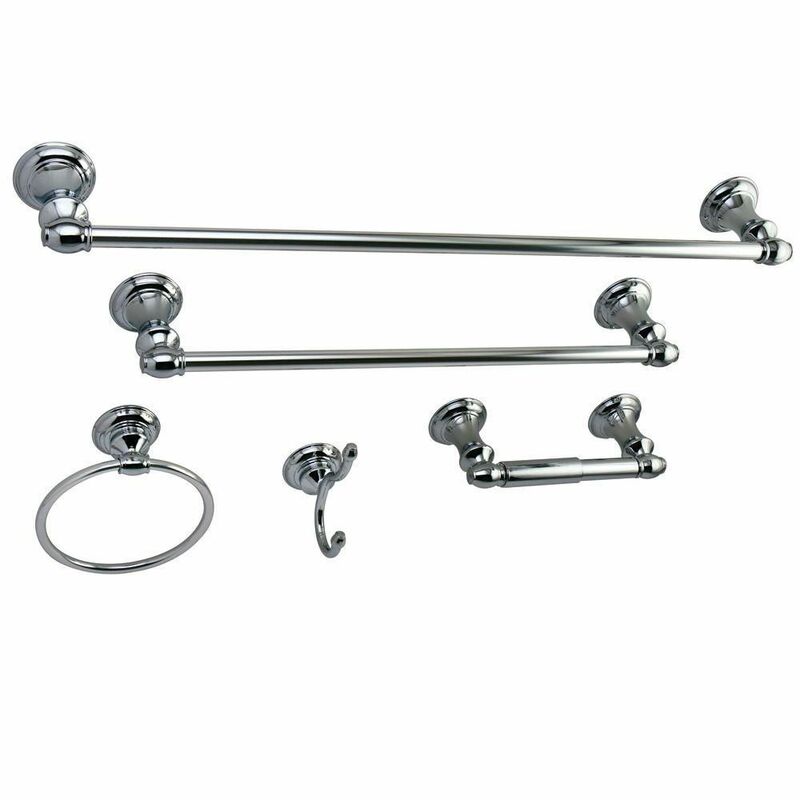 Finished in bright, polished chrome over durable zinc construction, the 5-Piece Bathroom Accessory Set includes 24-inch and 18-inch towel bars, a towel ring, robe hook and tissue holder to complete your bath upgrade. Easy to install with included hardware, this set also features a concealed mounting design that creates a seamless look with no visible hardware, ensuring clean style throughout your bathroom. Complete your bathroom with this matching accessory set. This set includes a chrome towel ring and toilet paper holder. Constructed with lead-free brass, this set is finished with a beautiful premium chrome plating. Complete your bathroom with this matching accessory set. This set includes a multi-rod towel rack and a single towel rod. Constructed with lead-free brass, this set is finished with a beautiful premium chrome plating. Featuring beautiful modern styling, the Alzato Brass 5-Piece Bathroom Accessory Set is sure to add the perfect finishing touch to your space. The dazzling triple-chrome finish is perfect for accentuating a master bathroom, guest bathroom or powder room. Each piece was constructed from brass for long-lasting style and durability. For a more cohesive look in your space, look for other items in the Fresca Bath Suite Set, including vanities, faucets, shower panels and toilets for a modern, cutting-edge look in your bathroom. Upgrade to the next generation of contemporary style with the Ottimo Brass 5-Piece Bathroom Accessory Set. Showcasing eye-catching lines and flowing curves, these Fresca bathroom accessories are crafted from brass with an exquisite, triple chrome finish. This set features a generously sized 26-inch towel bar, towel ring, robe hook, tissue holder and soap dish. Imported and selected for its modern, cutting-edge design, the Ottimo set beautifully complements other Fresca pieces for a coordinated theme, including vanities, faucets, shower panels and toilets. 5-Piece Bathroom Accessory Set in Polished Chrome Designed to evoke a sense of understated elegance, this collection from Kingston Brass exquisitely enhances both traditional and transitional styles of decor. Finished in bright, polished chrome over durable zinc construction, the 5-Piece Bathroom Accessory Set includes 24-inch and 18-inch towel bars, a towel ring, robe hook and tissue holder to complete your bath upgrade. Easy to install with included hardware, this set also features a concealed mounting design that creates a seamless look with no visible hardware, ensuring clean style throughout your bathroom. 5-Piece Bathroom Accessory Set in Polished Chrome is rated 4.3 out of 5 by 28. Rated 5 out of 5 by Motomom from I ordered this set to match the Kingston Brass ... I ordered this set to match the Kingston Brass Chrome faucets I purchased. A really nice set at a very reasonable price. A complete set of everything you’ll need to outfit your bathroom. Rated 4 out of 5 by Charlie from This set is attractive, durable and mount solidly to the wall. I give this accessory set 4 stars ... This set is attractive, durable and mount solidly to the wall. I give this accessory set 4 stars instead of 5 because it was not the set I wanted, but the price is right. Rated 5 out of 5 by Anonymous from Love them!... Love them! Rated 5 out of 5 by Dvrdeb from Excellent value for this product. Easy to install. ... Excellent value for this product. Easy to install. Good quality. Rated 5 out of 5 by Donald from Looks great went up easy. These have the screw tightening... Looks great went up easy. These have the screw tightening mounts which are more solid than the push on mounts. Rated 4 out of 5 by CCC from Quite pleased with the sturdiness of the material. Needed chrome and Looks great. Cannot beat pr... Quite pleased with the sturdiness of the material. Needed chrome and Looks great. Cannot beat price. Bought 2 sets and would recommend.